Are you looking for a super simple dessert that will wow your guest? My Salted Pistachio Bark is a total crowd pleaser! Hold on you say - what about all the sugar in chocolate? How is this good for me? Let's explore that and the importance of Dark Chocolate. 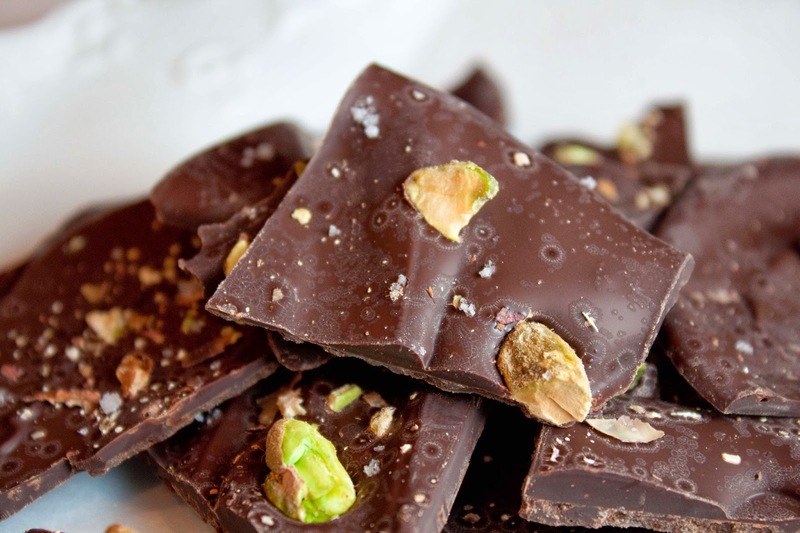 Dark chocolate is full of antioxidant which help free your body of radicals, which cause oxidative damage to the cells. 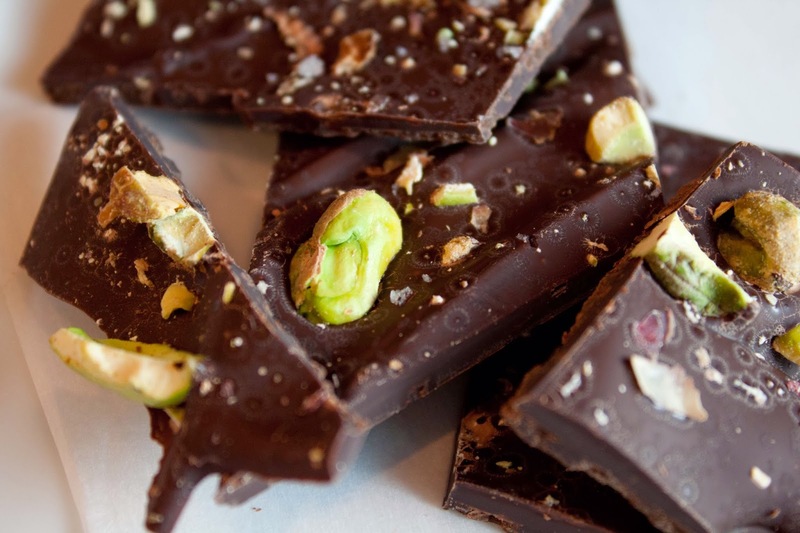 The flavonoids in dark chocolate also help reduce insulin resistance by helping your cells to function normally and regain the ability to use your body's insulin efficiently. Because it's not loaded with extra sugar it boasts a low glycemic index, meaning it won't cause huge spikes in blood sugar levels. If you are new to dark chocolate, it may come across as bitter to you. But keep in mind when you begin to ease back on your sugar intake, your sensitivity to sugar is heightened allowing you to appreciate it more. Yet another reason to reduce your sugar intake. In this particular recipe I used a 60% dark chocolate because of the crowd I was feeding; if you are not used to such a high percentage, it can be bitter and even unpleasant for some. It's ok to ease into the an 80% dark chocolate. Keep in mind this is not the kind of chocolate that should be mindlessly chomped on; quality chocolate should be slowly savored allowing it to melt in mouth while tantalizing your taste buds. Treat yourself with this Fat and Happy (and healthy) Salted Pistachio Chocolate Bark: it's ooh so tasty and guilt free! Fat and Happy Food Blog Tips and Techniques: Mix this recipe up by adding other nuts (try almonds, macadamia nuts or pine nuts). Also add dried fruit like cherries or cranberries for a more festive flavor. Melt the chocolate: If you are using a bar of chocolate, chop it up into pieces to help it melt faster and more evenly. Place the chocolate in a heatproof bowl (choose a bowl size that gives you room to stir) and set that over a pan of simmering water. The base of the bowl needs to sit above the water without touching it. Do not get any water in the chocolate, if even a drop mixes in the chocolate will seize up and you will have to start over. Allow the chocolate to melt so that it is smooth, shiny and glossy. You will see part of the chocolate turn glossy, stir the chocolate at this point to help melt the rest- don't wait for all the pieces to turn glossy. This will help from overheating and burning the chocolate. Now add your toppings starting with the pistachios; I take the time to push some of the nuts in slightly to make sure they are set in the chocolate. Now sprinkle the salt for the finishing touch. The chocolate needs to solidify again, this will take a few hours depending on the temperature in your house. If you are in a hurry you can set this in the fridge (assuming you placed the paper in a sheet pan and not on the counter. I like to make this the night before I need it and let it set up overnight. Chop or break into pieces and enjoy.